Iran’s defence minister has lashed out at American authorities for making the false claim that they aim to help Iranians by imposing sanctions on the Islamic Republic. Brigadier General Amir Hatami said US President Donald Trump and Secretary of State Mike Pompeo lie like a rug when they say their actions against Iran are aimed at supporting Iranian people. His comments came ahead of the re-imposition of US unilateral sanctions against Iran on Monday, which is mainly aimed at destroying the Iranian economy, and will mostly hurt the Iranian nation’s access to basic supplies like food and medicine. While the US claims it has exempted the export of food and medicine to Iran, its sanctions on the country’s banking transactions with the world practically keep Iranian people from having access to foreign-made drugs and food, which will finally endanger millions of civilian lives. General Hatami further said Iranian officials are doing whatever they can to mitigate the hardships caused by the US for Iranians. He said the most important threat to the Middle East is foreign presence and interference in the region. The defence minister urged all countries to join hands to establish security in the regional and not to rely on foreign powers for the maintenance of security. He further said the Defence Ministry has plans to boost the country’s missile capability. 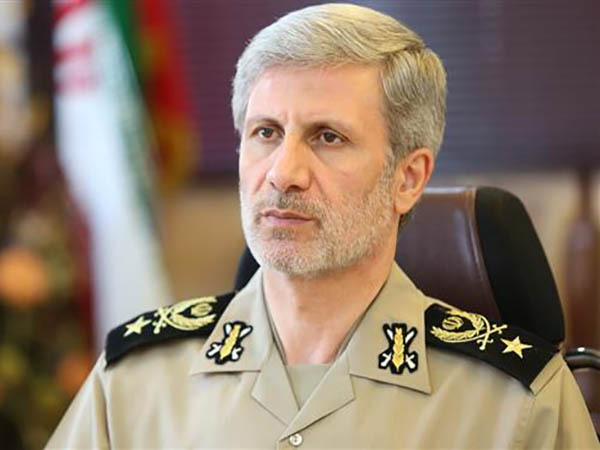 “Iran’s missile power is an effective contributor to deterrence against threats; that is why the enemies are sensitive about this issue,” he said. The defence chief said Iran has precise plans for its missile program because the maintenance of “our own security and that of our friends in the region” hinges on the country’s missile capability. “Our enemies do not want to prevent us [from doing our activities] only verbally; rather, they seek to reinforce anti-missile [defences] in the region; and we will, proportionately, seek to improve the quality, precision and power of our missiles to strike the targets that threaten our security,” he added.